Lectern, 20th century, from unknown location. Carved sides with front central Star of David, and molded capital. Leather insert covers the angled surface, which supports reader’s prayer book. The Jewish connection is evident from the Star of David that adorns the lectern, and from its similarity to other examples of synagogue furniture. 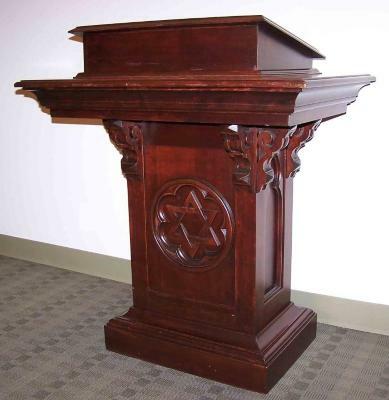 The Jewish connection is evident from the Star of David that adorns the lectern, and from its similarity to other examples of synagogue furniture.